This is my trigonal chess entry for the 45 or 46 cell 2007 design competiton.Â Â It uses short range step pieces and sliders with curved paths onÂ an amphora shaped board. 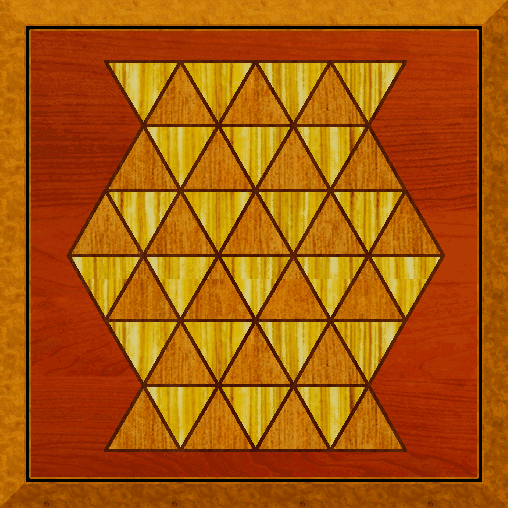 The board is constructed from 46 equilateral triangles (trigons or trigs) arranged in 6 ranks; the two centre-ranks having 9 files each, with the outer four having 7. The pieces are circular with either a gold or red background and a symbol that is indicative of that piece's movement. The King may move a single step to any one of the 3 adjacent edge-conneccted trigs provided that trig is safe (not atttacked by an enemy piece). In the image on the right these 3 adjacent trigs are indicated by grey dots. The King has no special castle move. The Dome moves in a series of up to 5 steps, each to an adjacent edge-connected trig, making a sixty-degree turn in a constant direction between each step. The Dome will thus follow a tight circular path, the full 5 steps plus the starting trig forming a hexagon. In the image on the right the 12 reachable trigs are indicated by grey dots. The Dome may not leap over other pieces but has 2 possible paths to each destination. The Gyro moves in a series of up to 5 steps, each to an adjacent point-connected trig of a different colour, making a sixty-degree turn in a constant direction between each step. The Gyro will thus follow a loose circular path, the full 5 steps plus the starting trig forming the points of a star centred on a hexagon. In the image on the right the reachable trigs are indicated by grey dots. The Gyro may not leap over other pieces. Between them a side's 3 Gyros cover only 35 trigs; the central Gyro covers 11 trigs while the 2 flankingÂ Gyros cover 12 each. The Stag's move must alwaysÂ contain both steps in the given order.Â Â It may not move just a single step nor make the point-connected step first. In the image on the right the maximum 6 reachable trigs are indicated by grey dots. The Stag may not leap over other pieces. When moving directly forward or sideways the Pawn may not capture and may not leap over other pieces. In the image on the right these moves are shown by grey dots. Pawns capture by moving forward to a trig of the same colour.Â These possible captures are shown by green dots.. There is no initial double-move and thus no En-Passant capture. 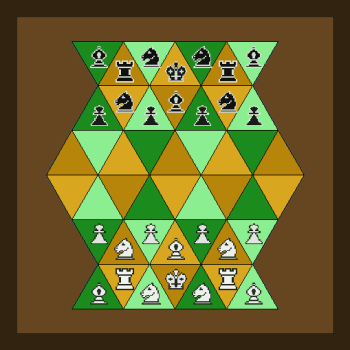 Pawns promote on reaching one of the 4 base trigs of the far-most rank, indicated for the gold player by green crosses. 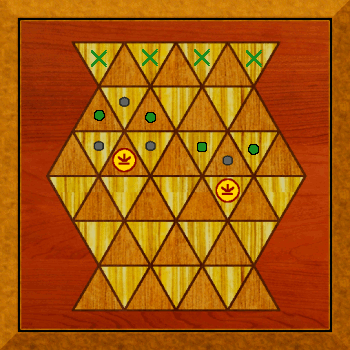 There are two players, shown here as Gold and Red. 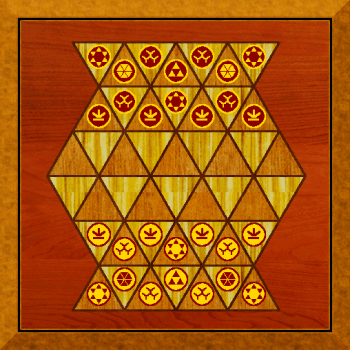 A player wins by checkmating the enemy King or stalemating the opponent. 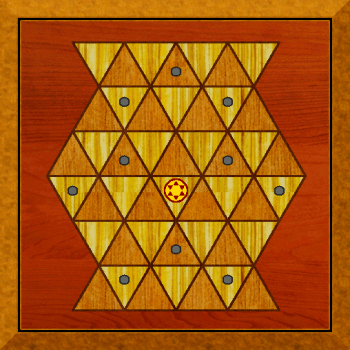 A player loses if they make a move that results in a board position occurring for the third time. Turns, consisting of moving a single friendly piece, alternate between the players with Gold going first. The movement of each piece is detailed above. The image on the right shows the start position using these pieces on a board coloured to show the Gyro's moves, as suggested in a comment by Abdul-Rahman Sibahi. Gilman Man & Beasts have no triangles yet either, http://www.chessvariants.org/index/msdisplay.php?itemid=MSmanandbeast01, but squares, hexagons and tetradedral. Good. So, rook and unicorn from my 64 triangles was invented before me. Interesting interpretation of 'sideways' (compare to my Triangular xiang-qi). 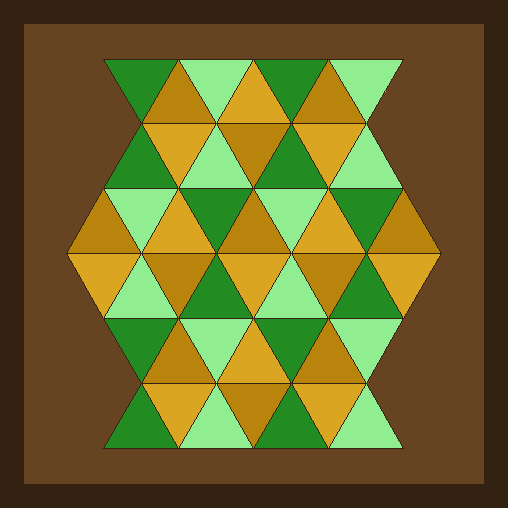 Hey, there are already quite many triangular variants! Maybe, there should be some shortcut in making triangular GC presets (other than hexagonal board, where one of colors is not used)? Ah .. right .. my mistake. I drew the Board with two extra rows in the middle! Er, I think it's now up to the editors to upload the piece set and the two boards. I can start from there. Abdul-Rahman, I have uploaded the now 2 empty boards to the graphics directory for this page. The piece icons are also there. The three Gyro's on a given side cover 35 trigs, the missing 11 trigs are those covered by the opponent's central Gyro.